As at least a couple government departments are now either building or considering installing a user research lab, we thought we'd re-publish the most useful of these posts here, on our user research blog. We’ve been thinking about the ideal chairs to buy for our usability lab’s desktop setup. As with most things, if you dig around, you’ll find more detail than you need. Lab chairs are no exception. 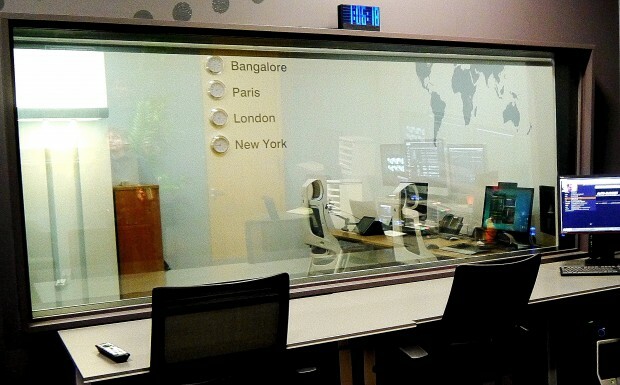 A lab that primarily tests with financial traders. We visited a lab that primarily tests with financial traders. Tobii eye tracking is one of their most important tools. They found that chairs with castors, swivel and arm rests allowed too much movement resulting in less-than-ideal eye tracking: arm rests encouraged traders to lean to one side; castors allowed for wheeling to and from the desk; chair swivel allowed participants to, well, swivel. To keep their traders relatively still, they bought desk chairs without arms, removed the wheels and locked out the swivel, maintaining height adjustability. The traders aren’t accompanied throughout the user testing session, as our participants generally are. Instead, they’re left on their own to engage in mock-trade scenarios using a system they’re familiar with. Perhaps this explains why the traders are prone to move in their chairs? It’s not long before they switch into ‘trader-brain’ and, in intense concentration, unwittingly move around. Did we need to think about modifying our chairs too? Tobii eye tracking has a reasonably wide field of capture. If someone moves out of the capture box, Tobii will pick up their eyes when they come back into it. You don’t need to set the participant up again. Even the most exuberant test participant can be kept track of. In fact, Tobii is successfully used in testing with special-needs adults, children and babies. The more heavy-duty and scientific research Tobiis might need thought around chairs. The Tobii model you’re getting is specifically built for testing on-screen applications. It’s a much less fussy affair. With the exception of chairs being height adjustable, other labs hadn’t thought too much about chairs. Regular desk chairs did the job just fine. Our test participants aren’t going to be sitting for hours on end. Gold-standard ergonomics chairs aren’t necessary. Relatively comfortable and easily-adjustable chairs are. Importantly, our chairs need to be easy for the infirm and mobility-challenged to get into and out of. 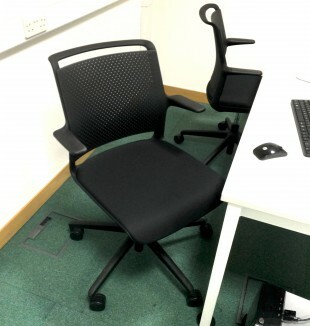 The task chair we've chosen for our lab's desktop pod. We chose a chair model with short arm rests, more like pegs, useful in standing up and sitting down but not generous enough to lean into. Even this might be an unnecessary consideration. We eventually opted for castors. We want our participants to feel they have freedom of movement, plus it’s easier to get into and out of a desk chair with wheels. Because we test with people of all shapes and sizes, we’ve chosen a chair that is height adjustable and generous enough to accommodate most widths. It turns out, height adjustability and swivel are inseparable. Because height adjustability is a must, we got swivel too. In short, we’ve just about got a standard desk chair. Wild goose chase or worthy investigation? The need to be specific about test participant chairs seems reliant on the circumstances of your testing, the eye tracker you’re using and your participants. We’ve come to the conclusion that, for our needs, chairs and eye tracking (or even goose-neck camera angles) aren’t of concern. Simple does it. Worthy investigation? Yes, I guess so. Now we know and so do you. We've learned that, when using eye tracking, it's best to seat users in a chair in which they cannot lean back. Here's why: when someone leans back in their chair, the eye tracking signal is lost. Every day a school day.